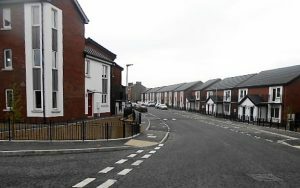 Acquired in 2010, this unique development was a partnership between Newington HA, North Belfast Housing and the communities of Tigers Bay and Newington. Straddling the Tigers Bay/Newington interface and the scene of much violence in the past this complex is now home to 22 households from both sides of the community in a shared housing project. This project is supported by a multi-agency forum with representation from the residents of the building, members of both communities, cross community interface workers, the PSNI and both Newington & North Belfast Housing. 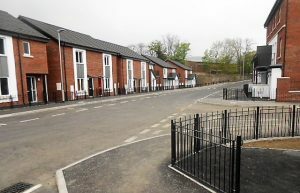 This scheme is a huge success for all partners involved in the project and the risks taken by both communities to change the status quo has been equally matched by North Belfast and Newington Housing Associations as well as the Northern Ireland Housing Executive, the Department for Social Development and PSNI. Since the project was completed in 2010, the partnership between both communities has been consolidated into the Duncairn Community Partnership http://www.duncairn.com/ . The DCP is made up by a number of member organisations namely, North Belfast Community Development and Transition Group (NBCDTG), North Belfast Interface Network (NBIN), Intercomm, Groundwork NI (GWNI), Tigers Bay Concerned Residents Group, Newington Residents Association and Star Neighbourhood Centre. Lakeview & The Glen was the first phase of an ambitious 3 phase regeneration scheme to transform an historically volatile interface area of North Belfast. Construction commenced in April 2011 and completed in April 2014. Construction of this second phase commenced in April 2013 and the project completed in August 2014 ahead of schedule and under budget. Underpinning all the redevelopment was the close collaboration between NHA, the design team, development agents and the local community which resulted in a programme of works that was sensitive to the aesthetic of existing homes in the area and the demands that the development would bring on the wider infrastructure including traffic flow. Retained buildings were re-habilitated and integrated with new-build construction and a number of special details, including a pedestrian wall, were reconstructed to embrace the previous traditions of the local community. Approximately 85 percent of the supply chain for the redevelopment came from local suppliers in Belfast and enabled the project to complete on budget and on time. At the core of the development is a successful partnership between NHA and the local community that ensures the housing solution works in sync with the values and aspirations of the neighbourhood. The brownfield site is bounded by the Limestone road, residents, commercial businesses and two primary schools and NHA embedded itself with the surrounding community to listen, inform and shape the works to minimise disruption. ‘Social clauses’ in contractor agreements with NHA also added jobs to the local and wider economy while new jobs have been created within NHA itself to improve its services and meet the needs of its tenants and service users. The Limestone Road re-development is a powerful example of the far-reaching benefits that can be realised through collaborative working between a housing association and the community it serves. NHA is grateful to the voluntary contribution of the residents groups who dedicated considerable time and effort to make these schemes and the wider regeneration possible. There is no doubt 2016 has been an extremely busy year for the Association. February 2016 saw the commencement of a phased handover of 75 new build homes at our Girdwood Development, North Belfast. The Association initially received handover of 9 no. new build homes at St James Mews, with the remaining 66 no. new build homes handed over in mid-May 2016. In late May 2016, the Association also acquired handover of 3 no. 4 bedroom new build homes on the Antrim Road, Belfast. Finally, in November 2016, the Association acquired handover of 26 new build homes at North Queen Street, Belfast. In total, 104 new build homes were acquired by the Association from the three new build developments at Girdwood (St James Mews, Kinnaird Street, Kinnaird Terrace and Kinnaird Avenue) Antrim Road and North Queen Street Belfast. These new affordable homes have provided much needed accommodation for single people and families who, in some cases have been awaiting accommodation for several years and were in severe housing need. 2017 was again an extremely busy year for the Association. In October 2017 we acquired handover of 38 new build homes at our Dunmore/Alexandra Park Avenue, Belfast. Then in December 2017, we acquired 8 of the 16 new homes constructed at Parkside Gardens, Belfast. The remaining 8 were then acquired in March 2018, along with 2 newly built homes in Newington Street, Belfast. In total, 56 new build homes were acquired by the Association in 2017/18. In June 2018, the Association acquired Phase 1 of the New Lodge Redevelopment, which consisted of 31 new homes located in Lepper Street & Stratheden Street, Belfast. Phase 2 (8 new homes) were then acquired by us in September 2018, followed by Phase 3 (18 new homes) in December 2018. The Association is expecting handover of an additional 14 new homes in March 2019, followed by a final 17 new homes in April 2019.